Great location, perfect for two couples area was quiet but we could find excitement just a few blocks away. Felt very safe in the area. I got home on Sunday and booked my next stay on Monday. We have enjoyed our dealings with all members of the team over the 10 years we've rented through Savannah Getaways. They are, without exception, friendly, responsive, efficient and knowledgeable. This property is fine for a short stay for 2 people. It is clean, quiet, comfortable and excellently located. It is lacking some items that would be appropriate for a longer stay. Very friendly, helpful, and knowledgeable. We enjoyed our stay. There was some construction going on behind the building, so the noise was a little aggravating, but the unit itself was nice and the location was perfect. Would definitely consider staying there again! Ideal for our family reunion, large seating areas for a group. I just loved it! It was so cute and had such character, and it was SO quiet! Kin, was very helpful with the book in and check in process. Loved the size and location of the condo. We had to change our dates a few times due to my husband's work demands and Kim was excellent in accommodating our request. She is great. We enjoyed our stay in this home and will consider it again for another stay. My family and I were in Savannah to attend the memorial service and to celebrate the life of my 102 year old mother in law. In addition our youngest son had just become engaged and it was going to be the first meeting between his fianc and my husbands entire family. Including a contingent from Canada! The entire staff of Savannah Getaways as well as the owner of the home my little part of the family stayed at made our entire event filled stay a success. It was enjoyed by all and all left with many fond life time memories. I can not say enough about the friendliness,kindness, compassion, availability, flexibility and patience of the Savannah Getaway staff and the owner of the home in which we stayed. True southern hospitality!!! This home is a perfect example of old Savannah. In a perfect location as well. Even my brother in law who owns a historic home himself in this area of Savannah was impressed with the home as well as its furnishings. Although there were only four people actually sleeping in the home the kitchen, dining room and living area are laid out perfectly, had enough housewares and was large enough to accommodate a brunch we served for our entire family that had gathered to remember and celebrate the life of my 102 year old mother in law who had just passed away. The location enabled us to also show off old Savannah to our new soon to be daughter in law who had never visited the area before. Thank you again to the staff and home owner! Best customer service I have received in a long while - thank you! Felt like a dream staying here. Could not have selected a better location, amenities and charm! Lynne and Kim were incredible. They did all of the leg work for me. I was arriving after midnight and they gave me locations to park in case I could not find it immediately outside of my rental. Kim was available 24/7. It could not have been a better experience. Thank you so very much! We stayed in 1007. This condo is absolutely perfect! Perfect location! Perfect "at-home" feel! Perfect decor! Perfect service from Savannah Getaways! Would most definitely stay here again. Highly doubt it gets any better than this rental in Savannah! Thank you! The Savannah Getaway team was wonderful. I asked where the trash chute was and they new where on the floor, (out the door, down around the corner, on the right) it was. They were very helpful and very kind. One of our better vacations and a good part of that is 1025. Really really nice place to stay! Our son and daughter-in-law walked in and said "wow"! Score one for the parents! Every employee was nice and helpful. All of my transactions were handled by email. The staff promptly responded to my messages and were thorough in the info supplied back to us. One of the best vacation properties I've ever rented. Both the staff at Savannah Getaways and the property owner were great to work with. They answered every question quickly and reassured us to let them know if at anytime we needed anything. The place was clean, had everything we needed and was the perfect size for two people. The balcony. It was the perfect way to end each day watching the sunset from the property. Team members were helpful and very thorough with any question's we had. We were overwhelmed and completely satisfied with everything! NO complaints what so ever! Helpful, efficient and extremely friendly. 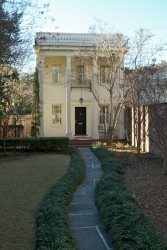 Loved the property in the historic district...it just seemed like the perfect spot for a Savannah stay.